Astro and Maxis have today formed a strategic partnership to combine existing Astro services with Maxis’ networking solutions. 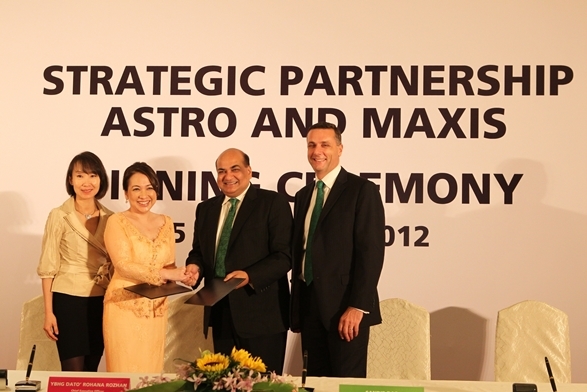 Under this partnership, Astro will appoint Maxis as its fibre broadband service provider to its B.yond IPTV service. In return, Astro will be the IPTV service provider for all Maxis fixed and wireless platforms. In addition, Astro will also provide its Astro On-The-Go service to Maxis subscribers. Currently only available to Astro subscribers, Astro On-The-Go makes available content from Astro TV and Radio channels, live events, Video On Demand and catch-up TV to be streamed onto Android and Apple smartphones and tablets, as well as PCs and laptops. Astro and Maxis are set to develop and unveil the consumer packages in phases through their respective distribution channels.